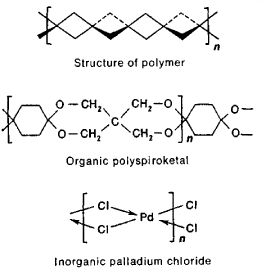 high-molecular-weight compounds of polycyclic structure, consisting of condensed rings. The ladder polymers acquired their name from the resemblance between the schematic projection of the plane of the macromolecule and a ladder. 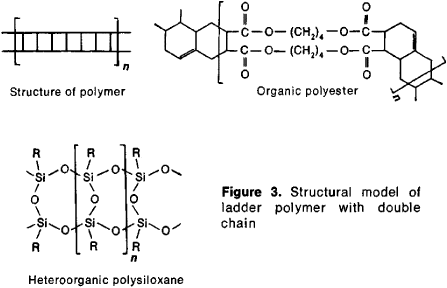 Depending on the chemical composition of the principal chain, ladder polymers can be organic (carbocyclic and heterocyclic), heteroorganic, or inorganic. They have greater thermal, chemical, and radiation stabilities than linear polymers of analogous composition. This difference occurs because the destruction of the principal chain of the macromolecule of a linear polymer requires the scission of only one bond (Figure 1, a), whereas the destruction of a ladder polymer chain requires the scission of two (Figure 1, b) or more (Figure 1, c) bonds. High thermal stability is also characteristic of other polymers with a regular arrangement of rings in the chain, such as the spiro-polymers, in which the rings are connected by one common atom. Structural models and structures of spiro-polymers and of some ladder polymers with regular linear lattice are given in Figures 2 and 3. Ladder polymers may be synthesized either by cyclization of the corresponding linear polymers or by direct polymerization or polycondensation of monomers. Industrial applications of most ladder polymers are limited by their insufficiently high mechanical strength. In addition, ladder polymers are difficult to process, since they are insoluble and infusible. Ladder polymers are used in the form of fibers, films, and coatings able to withstand the action of heat, light, radiation, and chemical reagents. Highly structured resins include liquid crystal polymers, interpenetrating networks, dendrimers, expanding polymers, ladder polymers, star polymers, and structured organic-inorganic hybrids.